The Dolores Project, located in the Dolores and San Juan River Basins in southwestern Colorado, develops water from the Dolores River for irrigation, municipal and industrial users, recreation, fish and wildlife, and hydroelectric power. It also provides vital water to the Dove Creek area, central Montezuma Valley area, and to the Towaoc area on the Ute Mountain Ute Indian Reservation. 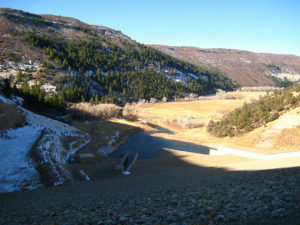 McPhee Dam and Reservoir is the principle storage feature of the Dolores Project which includes a system of canals, tunnels, and laterals to deliver water to over 61,000 acres of land. The economy of the area will benefit from increased agricultural production and strengthened service-related enterprise dependent on agriculture. The municipal and industrial water supply of 8,700 acre-feet will permit a moderate, but healthy, future growth rate for the area. A quality catch and release trout fishery has been created below the dam with releases of water from McPhee Reservoir. When reservoir inflow is high enough during spring runoff, releases will be made for white-water rafters. Today, the reservoir and boat ramps, campgrounds, roads and other constructed facilities have created recreational opportunities for the enjoyment of the public.